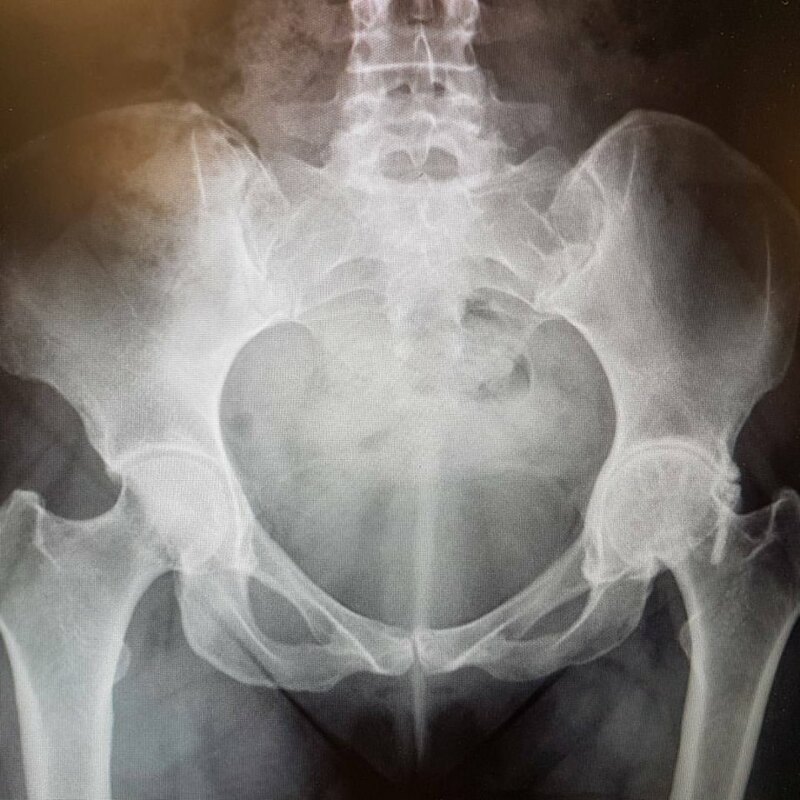 Anyone who has been following me on social media over the past week will know that I've been struggling to get to the computer following my hip replacement operation last Tuesday. But I'm also stubborn enough to know that if there is something I really want to do then even having this horrible surgery won't stop me - so although the deadline is tonight, I wanted to get my photos up on this blog to enter Urban Cottage Industries 'Let There Be Light' blogger competition showcasing a photo with natural light as well as one with artificial light. Urban Cottage Industries is a UK based business where you can find pretty much everything you need for your lighting needs. I've been having a look around there website and I love how funky yet functional their products are! It was taken when we visited Dover Castle and it was just so striking to see such a bright ray of sunlight filtering through that narrow slit of a window in a part of the castle that was such so dark. It actually felt like it spoke to me with symbolism - like it represents a glimmer of hope in dark times. 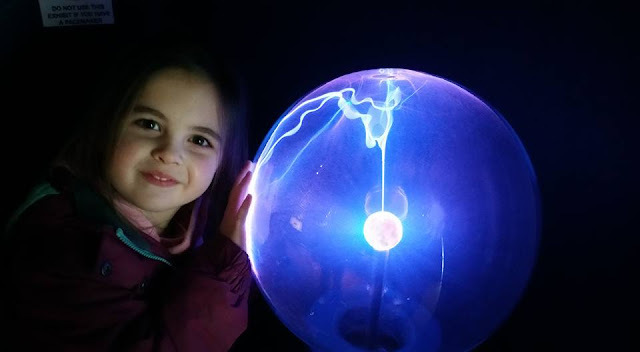 My 'Articificial Light' photo was taken when we visited Herstmonceux observatory. It was taken when Miss T saw the plasma ball. She was just so mesmerised by it (rightly so - as I find myself wowed by them too) and how the light it in works. The magic that happens when you place your hand on the glass and it's like drawing a bolt of lightening towards you! Just aweinspiring! As a general rule, I prefer to cook meals from scratch, but there are certain days when that just isn't possible. Fridays for example. For most people, Friday night is a case of 'the weekend starts here' but for us it's a crazy-busy day. After school, D has his guitar lesson, followed by Miss T's girl's brigade (where I also volunteer as a helper), next it's J's piano lesson, finally followed by both the boys going to Boys Brigade (where Richard volunteers as a helper). That takes us from 3.15pm through to 10.15pm on Fridays when the boys get home from Boys Brigade. So where exactly does dinner fit in? You do the math as they say...there is very little time to get a meal ready at any point throughout the evening. We used to make Friday a takeaway night - but even trying to squeeze in the time to pick up a take-away was throwing all our timings out. And the rest of the weekend isn't always much better with Miss T's drama class on Saturdays, zooming around Tesco for our grocery shopping, church on Sundays, and J's special needs club too to fit in. So it really was a case of Rustlers to the rescue when we realised that these Southern Fried Chicken Burgers can be ready in just 90 SECONDS! Yep, 90 seconds in the microwave! Wow! That is certainly going to help with the weekend mayhem in our household. 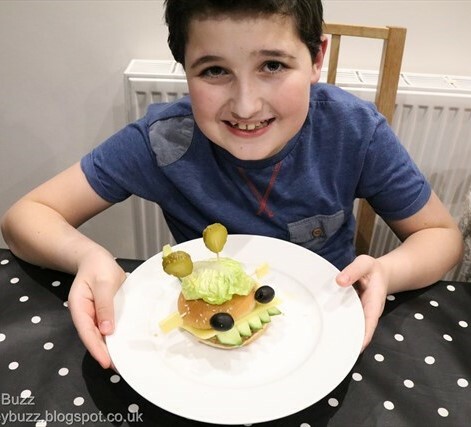 As the Chicken burgers take such little time to prepare, it gives us time to get a few other ingredients ready to make these a really fun family meal where the kids can get involved too. I put together a big platter of ingredients - Mainly the usual items we have in our fridge and store cupboards. For example, my kids adore gherkins and olives so I've always got jars of those to hand. Some of the veg I cut in different ways eg. carrots cut both into slices and batons. Cucumber cut into zig-zag spikes, That way it gave the kids the flexibility to get creative in any way they wished. 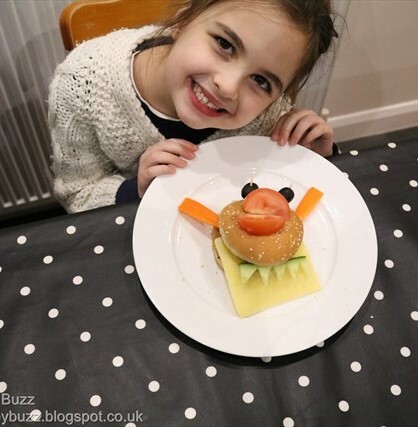 So we ended up with fun MONSTER BURGERS! All 3 different, but all three super fun and convenient and tasty. We didn't end up using all these ingredients as you can see from the video and photos but I wanted to have plenty of choice for the kids creative juices to run wild. 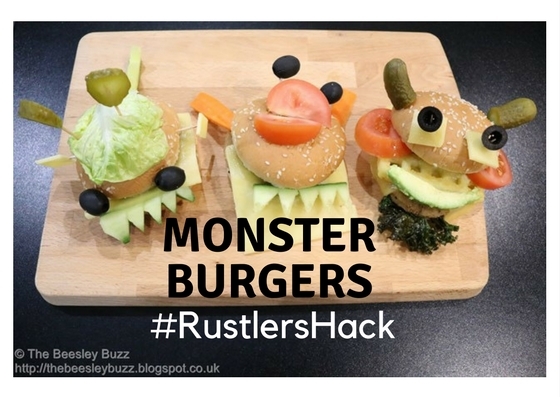 So even if you only have a few ingredients, there is still the potential to make your own monster burgers. Just go with whatever you have in the fridge at the time. It's loads of fun! I was impressed to find out that the chicken used in Rustlers, the UK's No1 Micro-snacking brand, is traceable to farm and their factory is BRC accredited which is mega-important in the food industry. They are available in loads of supermarkets and grocery stores. We picked ours up at Tesco. Disclosure: We were sent a £20 Tesco voucher to purchase Rustlers Southern Fried chicken burgers and ingredients for this challenge. All opinions are our own. Aarrrgh! I found myself yelling in the night as I awoke again with crippling pain in my left hip. It was frozen with pain and stiffness and I was unable to move it. The weight of the quilt on it was making the pain worse. I woke Richard and asked him to lift the quilt gently. Arrrghhh! I yell again 'don't wobble the bed!'. Any movement caused more excruciating pain. I'd forgotten how bad it got. This horrible thing called Arthritis. I'd assumed my hip just had the leftover consequences of being damaged from the JIA I had when I was 10 and that's why it had such limited movement but I wasn't used to these levels of pain in my hip for the past 30 years ago. Back pain I know all about as, with my hip out of alignment over the years, my back has got progressively worse. It was my back pain at the start of last year that triggered me to ask my rheumatologist about going onto methotrexate in the hope it may work the way it has been helping Miss T. One discussion led to another with long waits for consultant appointments in between and then in November it became clear that the only hope of resolving or improving my back pain was to have a total hip replacement of the left hip. That surgery has been scheduled for this coming week. In turn this meant coming off all my herbal remedies that I had been taking. I'd taken myself off my prescribed medication, Arcoxia, as I found that it was pushing my blood pressure sky high. So instead I was taking GOPO rosehip supplement which I'd continued taking since doing a trial back in June 2014. I added curcumin extract and boswelia extract to my herbal meds intake when I came off the Arcoxia last year. I was also using magnesium oil intermittently applied directly to my back and magnesium citrate orally in the evenings. I'd have Vitamin D spray of 3000 IU. I even had some bespoke tea and herbal medicine made up by a herbalist to help. Occasional krill oil and omega oils also added to the list. 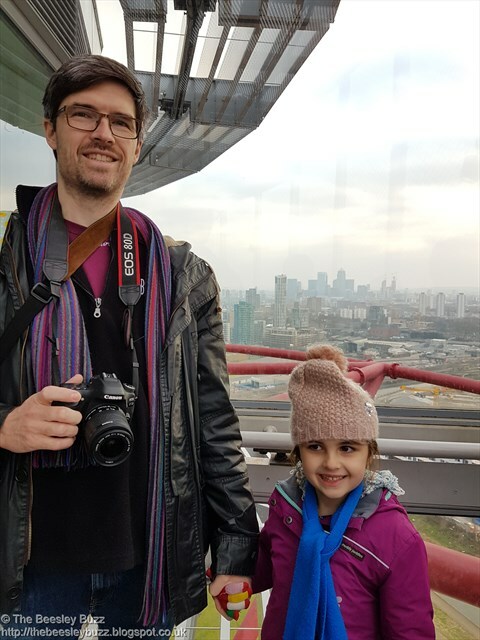 In my early years of having JIA I'd tried so many alternative remedies - basically anything and everything that anyone suggested, my parents would be keen to try to see if it helped. I wore a copper bangle for years. "Drink cider vinegar and honey" someone said. So I did. "Rub stinging nettles over the affected joint" was someone else's suggestion. So yep that happened too. I've seen chiropractors, osteopaths and massage therapists. Each time with a hope that "this time it really will help". But none of it did. So in all honesty, whilst I sensed that all my herbal remedies were helping a bit in improving my pain and symptoms, I hadn't realised just HOW MUCH they were helping. It is only since stopping them that I realise how much pain I am in now without their help. Initially the thought of such major surgery was a worry. Was it really necessary, I wondered. But last night after so many nights of pain becoming progressively worse again, the surgery can't come around quick enough. How many more nights can I bear. Of screaming out in pain each time I wake through the night and find myself unable to move. Once moving through the worst of the pain into a new position and then feeling pain throbbing all down my leg - right down to my ankle I could feel it, and all around my back of course as a hip that is unable to move ends up moving using the back in a way that it shouldn't be moved. There were always going to be mixed feelings when the time for the hip replacement came but now I feel ready for it. We spend a wonderful couple of weeks in Mauritius last summer and it seemed to take me forever to get the diary blogposts up afterwards. One final thing I like to do is have a summary blogpost which has links to all the others in one place so that I can find it all easily again! 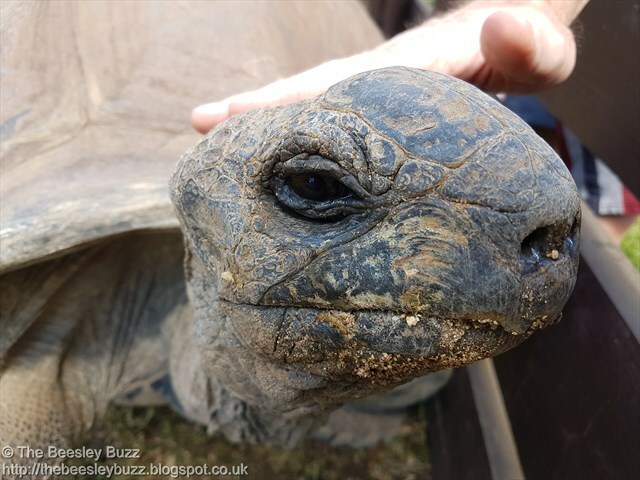 Mauritius Diary - Post 1 - Getting there, accomodation, beach, giant tortoises, glass bottom boat, pool. Mauritius Diary - Post 4 - tour of the island, wild monkeys, rain! Mauritius Diary - Post 5 - Tennis, animals, pedalo, kayaks, paddleboard adventure!!! Mauritius Diary - Post 7 - Archery, animals, parasailing! Mauritius Diary - Post 8 - Rain, scuba diving, more rain! I've missed this blog. Any blogger knows that keeping a blog going takes time and commitment and as easy as it may look, by the time the words are written and photos uploaded - it always ends up taking me longer than I thought to write a blogpost. But so many of our memories are captured on this blog and when I've tried to pinpoint times of events and experiences that haven't made it onto the blog, I'm at a total loss as to where to look to find the photos - Which year, which month, which date to start looking. Miss T wanted to put together a book about herself in London. She's always had a thing about London and an obsession with London landmarks. 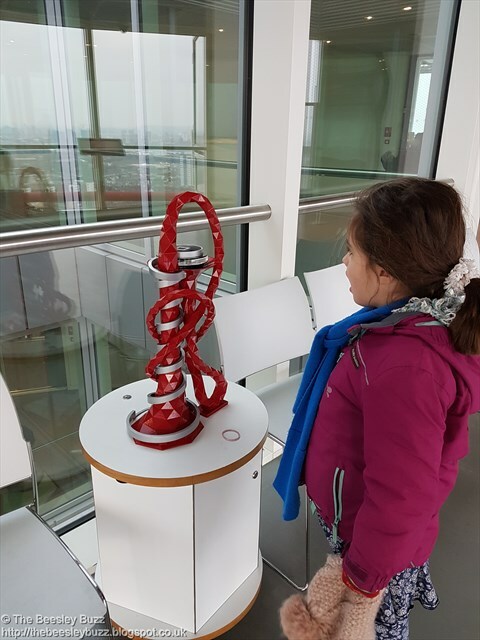 She's been lucky enough to visit the London eye, the Shard, the Thames RIB speed boat (which we did get around to blogging about here and here), and Tower Bridge. But where to start with pulling together the photos she wanted for her book! 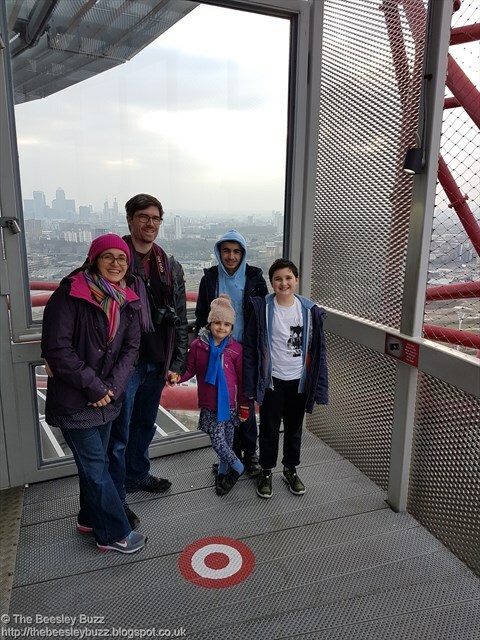 Before I start looking I thought I'd add her latest London experience to the blog so that at the very least we'll have a record of that. 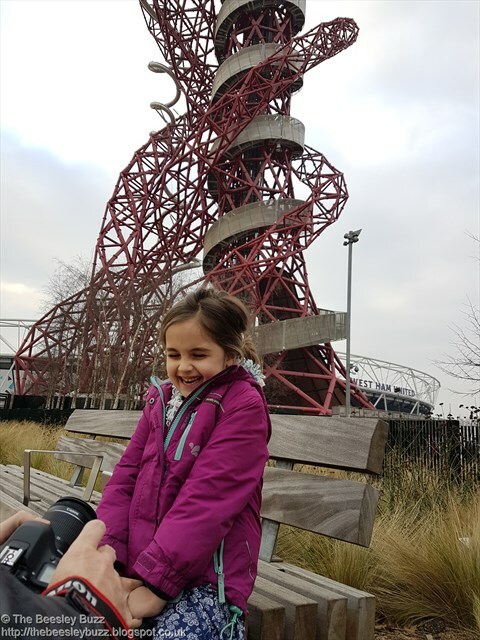 Although at age 5, she was too young to 'ride the slide' at the Orbit (you need to be at least 8 years old), she loved seeing the views and she enjoyed the experience of being there at another London landmark. Just look at the excitement on her face! 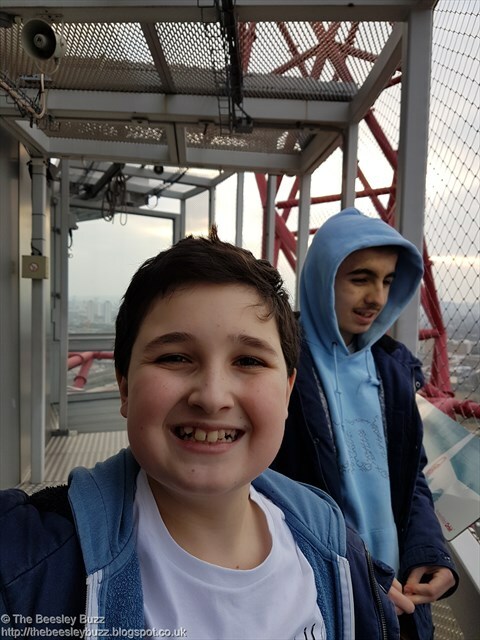 The boys enjoyed the views too but they were REALLY looking forward to the slide - the world's tallest and longest tunnel slide. Just look at those turns - eek! There are two floors - the top floor where you can see the views from inside and outside and the first floor where The Slide starts from. You're given safety gear to wear - a padded soft helmet and arm guards and you slide down in a kind of bag. The staff were brilliant and very reassuring about it being so much fun. 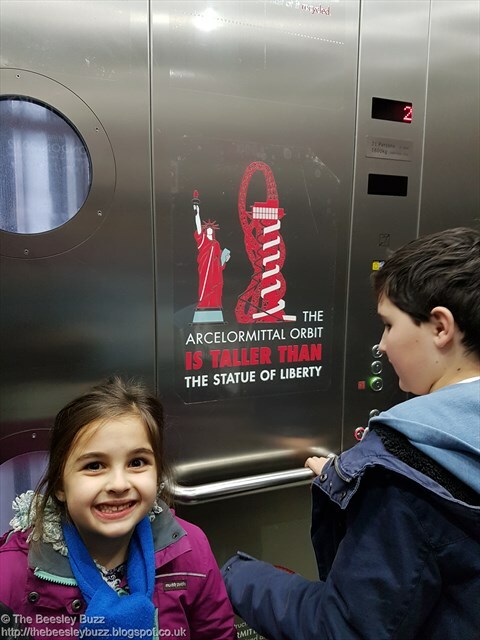 It is a 40 second descent with plenty of twists as you go down and dark and light sections of the slide. They recommend allowing an hour for your visit which we found to be just right. 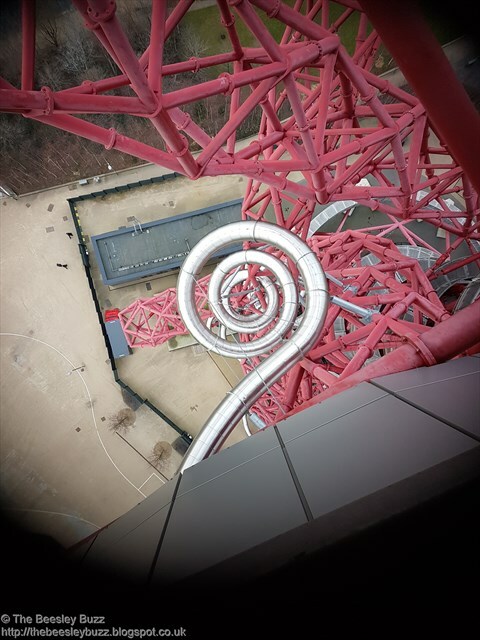 So another fab attraction to add to our list of fave London landmarks!